It’s 8:00 pm on a Tuesday night. 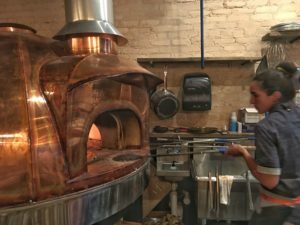 In Petworth, a steady stream of customers flow into Timber Pizza Co. to grab a “Neapolitan ish” wood-fired pie, freshly made salad, and an icy cocktail or a brew. The woman at the register greets guests with a friendly “Is this your first time here?” The restaurant is a mere two weeks old, so customers in front of me are answering yes, and a few follow up by saying “I live nearby.” I smile proudly and say no, I was here just a few days ago. Upshur Street NW is quickly becoming a dining destination, with Slim’s Diner, Twisted Horn, the pop-up Cappy’s Crabs, and Timber Pizza all occupying the same block. 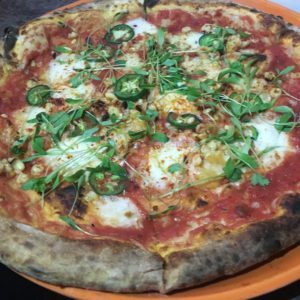 My realization that it’s only a 35 minute drive from where I live in Silver Spring to Timber Pizza is part of the reason for my two closely-timed visits. Co-owner Andrew Dana is a close friend of my new son-in-law, which factors in as well. I’ve been hearing about Timber Pizza and its unique back story for some time. Two years ago Dana and his partner Chris Brady decided to venture into the pizza business with little more than desire, a truck hauling a wood-fired oven, and investors. The mobile version of Timber Pizza became a success, as the duo served up sought-after slices at farmers markets and special events. 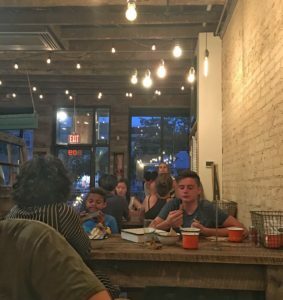 The restaurant debuts with an appealing decor of reclaimed wood tables, light brick walls, an impressive copper wood-fired oven, and a copper-covered bar where seats are in high demand. Chef Dani Moreira has joined the team as Executive Chef, although Dana is still hands on with the pizza-making. Moreira brings with her a degree from the Culinary Institute of America and experience at some top-rated Manhattan restaurants. She infuses her Argentinian background into the food at Timber Pizza, which includes empanadas filled with pork and another with roasted vegetables. 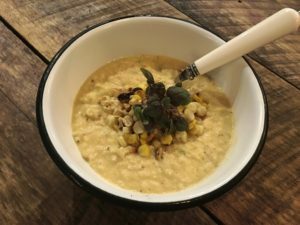 A bowl of chilled corn soup is touched with the heat of the wood-fired oven as well as jalapeno peppers. It’s a satisfying accompaniment to pizza, as are the salads. The Larkin is an abundant serving of nectarine slices, heirloom cherry tomatoes, pickled shallots, pea shoots, and purple basil. If you’re not a lover of salad dressing ask for it on the side, as its a generous pour. 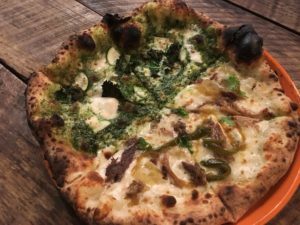 What differentiates Timber Pizza from the other spots popping up all over DC are fresh ingredients plucked from local farmer’s markets and eclectic flavor combinations. The Asher is distinguished by roasted corn, hot peppers, micro-cilantro, and smoked paprika. While the thin crust doesn’t fully retain the crispness I personally favor in pizza, it has a respectable char. More importantly, I am wowed by the full-on flavor. And if I can forego my obsession with crisp pizza crust and still find love, that’s saying something. Having a hard time deciding between intriguing vegetable toppings and something more meaty? On my second visit, I go half and half with the Green Monster and The Lot. The zesty Green Monster, topped with pesto, mozzarella, feta, zucchini, and kale was recently named by The Washington Post as one of “The 40 Most essential DC restaurant dishes of 2016.” It’s an impressive accomplishment – and well-deserved. Despite the accolades for the Green Monster, I prefer The Lot. Beguiling toppings on this gem of a pizza include 16-hour slow roasted pork, jalapenos, and mango. Don’t skip dessert! There’s only one option- but when it’s Dolcezza gelato with fire-roasted fruit, granola, and housemade ice cream cones, who needs to make decisions? 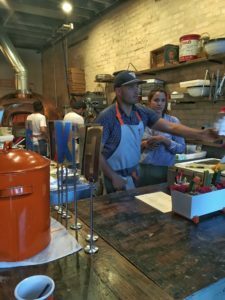 Timber Pizza Co ignites an already hot market for pizza in DC. I hope I’ve sparked your interest to give it a try! Timber Pizza’s mobile operation is still active. Check the website for details.